The simplest picture of a black hole is that of a body whose gravity is so strong that nothing, not even light, can escape from it. Bodies of this type are already possible in the familiar Newtonian theory of gravity. The “escape velocity” of a body is the velocity at which an object would have to travel to escape the gravitational pull of the body and continue flying out to infinity. Because the escape velocity is measured from the surface of an object, it becomes higher if a body contracts down and becomes more dense. (Under such contraction, the mass of the body remains the same, but its surface gets closer to its center of mass; thus the gravitational force at the surface increases.) If the object were to become sufficiently dense, the escape velocity could therefore exceed the speed of light, and light itself would be unable to escape. Taking relativistic considerations into account, however, we find that black holes are far more exotic entities. Given the usual understanding that relativity theory rules out any physical process going faster than light, we conclude that not only is light unable to escape from such a body: nothing would be able to escape this gravitational force. That includes the powerful rocket that could escape a Newtonian black hole. Further, once the body has collapsed down to the point where its escape velocity is the speed of light, no physical force whatsoever could prevent the body from continuing to collapse down further – for this would be equivalent to accelerating something to speeds beyond that of light. Thus once this critical amount of collapse is reached, the body will get smaller and smaller, more and more dense, without limit. It has formed a relativistic black hole; at its center lies a spacetime singularity. For any given body, this critical stage of unavoidable collapse occurs when the object has collapsed to within its so-called Schwarzschild radius, which is proportional to the mass of the body. Our sun has a Schwarzschild radius of approximately three kilometers; the Earth's Schwarzschild radius is a little less than a centimeter. This means that if you could collapse all the Earth's matter down to a sphere the size of a pea, it would form a black hole. It is worth noting, however, that one does not need an extremely high density of matter to form a black hole if one has enough mass. Thus for example, if one has a couple hundred million solar masses of water at its standard density, it will be contained within its Schwarzschild radius and will form a black hole. Some supermassive black holes at the centers of galaxies are thought to be even more massive than this, at several billion solar masses. 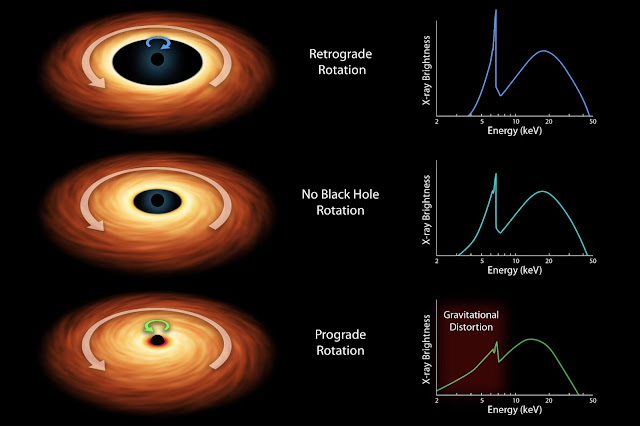 The “event horizon” of a black hole is the point of no return. That is, it comprises the last events in the spacetime around the singularity at which a light signal can still escape to the external universe. 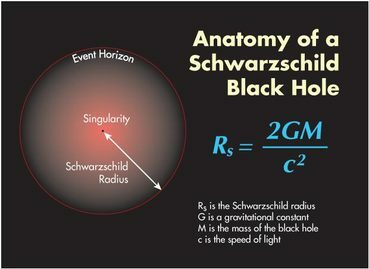 For a standard (uncharged, non-rotating) black hole, the event horizon lies at the Schwarzschild radius. A flash of light that originates at an event inside the black hole will not be able to escape, but will instead end up in the central singularity of the black hole. A light flash originating at an event outside of the event horizon will escape, but it will be red-shifted strongly to the extent that it is near the horizon. An outgoing beam of light that originates at an event on the event horizon itself, by definition, remains on the event horizon until the temporal end of the universe. From the perspective of the infalling person, however, nothing unusual happens at the event horizon. She would experience no slowing of clocks, nor see any evidence that she is passing through the event horizon of a black hole. Her passing the event horizon is simply the last moment in her history at which a light signal she emits would be able to escape from the black hole. The concept of an event horizon is a global concept that depends on how the events on the event horizon relate to the overall structure of the spacetime. Locally there is nothing noteworthy about the events at the event horizon. If the black hole is fairly small, then the tidal gravitational forces there would be quite strong. This just means that gravitational pull on one's feet, closer to the singularity, would be much stronger than the gravitational pull on one's head. That difference of force would be great enough to pull one apart. For a sufficiently large black hole the difference in gravitation at one's feet and head would be small enough for these tidal forces to be negligible. One of the most remarkable features of relativistic black holes is that they are purely gravitational entities. A pure black hole spacetime contains no matter whatsoever. It is a “vacuum” solution to the Einstein field equations, which just means that it is a solution of Einstein's gravitational field equations in which the matter density is everywhere zero. (Of course, one can also consider a black hole with matter present.) In pre-relativistic physics we think of gravity as a force produced by the mass contained in some matter. In the context of general relativity, however, we do away with gravitational force, and instead postulate a curved spacetime geometry that produces all the effects we standardly attribute to gravity. Thus a black hole is not a “thing” in spacetime; it is instead a feature of spacetime itself. to if our definition is to make sense. The most common method of making this idea precise and rigorous employs the notion of “escaping to infinity.” If a particle or light ray cannot “travel arbitrarily far” from a definite, bounded region in the interior of spacetime but must remain always in the region, the idea is, then that region is one of no escape, and is thus a black hole. The boundary of the region is called the event horizon. Once a physical entity crosses the event horizon into the hole, it never crosses it again. 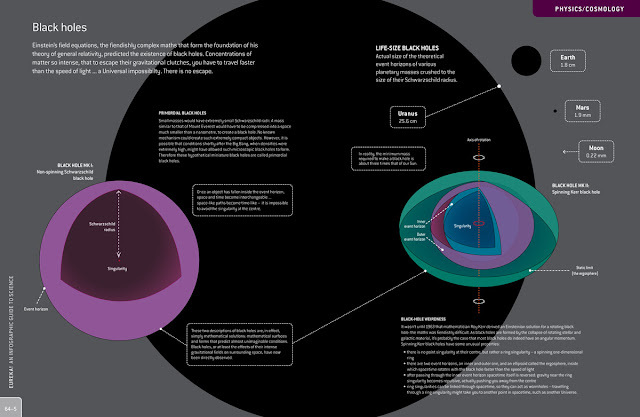 Figure 1 is a spacetime diagram of a sphere of matter collapsing down to form a black hole. The curvature of the spacetime is represented by the tilting of the light cones away from 45 degrees. Notice that the light cones tilt inwards more and more as one approaches the center of the black hole. The jagged line running vertically up the center of the diagram depicts the black hole central singularity. As we emphasized in Section 1, this is not actually part of the spacetime, but might be thought of as an edge of space and time itself. Thus, one should not imagine the possibility of traveling through the singularity; this would be as nonsensical as something's leaving the diagram (i.e., the spacetime) altogether.